With more than 60 years of experience, Disperator has developed the knowledge that makes them specialists in production, development and distribution of equipment for the efficient handling and source sorting of food waste. 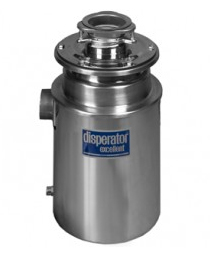 Combined with excellent reputation and high quality products, Disperator has achieved a market-leading position in equipment for the handling of food waste in the maritime industry worldwide. 500 excellent series comply with IMO Marpol Annex V as verified by DNV. Do you have enquiries or suggestions? Would you like to have/see samples or references?